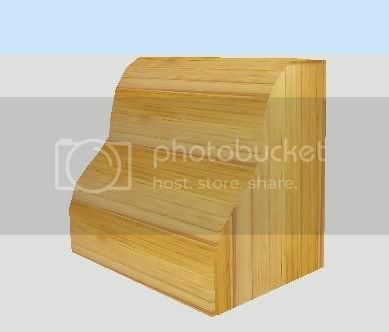 I know that I can import .obj furniture like a framed picture, but I want to have my own picture, of which I have a .jpg. I thought maybe I could modify the .mtl file, but couldn't figure out how to do it. I have made quite a lot of furniture with AoI, and tried making my own .obj/.mtl object, but when I do, the picture is TILED in both directions, even though I was very careful to uncheck the boxes in AoI for Tile Vert. & Tile Horiz. It looks OK in AoI, but when I import it as furniture, it is tiled! Anyone know what to do? 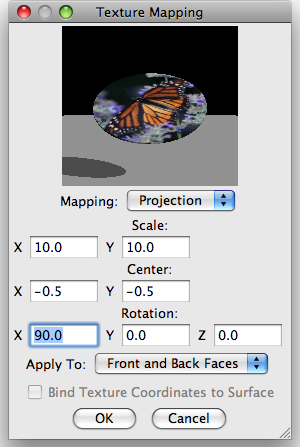 Are your models correctly rendered in Art Of Illusion with Scene > Render menu items? Did you check the texture mapping applied to your objects ? You can change it by choosing the Set Texture... item in the contextual menu of an AOI object, then clicking on the Edit Mapping... button. You know, I saw that and started to use it once, but got off the track! I'll go back now and see if I can work it with that. Many thanks for the tip! Everything seems proper until I try to import the .OBJ/.MTL into SH3D. As can be seen from the following screen shots, I can complete all the steps and render the object in AoI and it looks correct. But whenever I try to import it into SH3D as furniture, it appears tiled. If you can determine what's going wrong, I will greatly appreciate it. Here's some screenshots, please take a look. I have made some progress. By UNchecking the Scale Texture To Object option and then experimenting with the X and Y Scale dimensions above, in the Texture Mapping dialog, I have been able to get several models to work, but it's extremely time consuming. I would have thought that the Scale Texture To Object would take care of that. And on my copper wall plate, I still can't get even close. If anyone has any tips or suggestions, I will appreciate reading them. I would suggest you to try to import your OBJ models in Wings 3D or in Blender, to check if your OBJ/MTL files were correctly generated (the Export Wavefront feature in AOI was updated recently and its developer could have forgotten to fix a bug). If you don't mind, you may also share one of your AOI models to let me (or an other contributor) check if there's a problem. Thanks so much for your attention, Emmanuel! I'm having difficulty using Blender, which is why I decided to use ArtOfIllusion a few weeks ago. It does appear that the models that import improperly into SH3D are also incorrect in Blender, though, so that suggests that I'm doing something wrong in ArtOfIllusion, or there's a bug in it. I find the learning curve for Blender requires more time than I am able to spend on it, so far. The computerdesk2 works fine, there is no image mapping, I just wanted you to be able to see that I can create a model. The rhodespicture works fine NOW, after I discovered that I could manipulate the Scale variables. The copperplate is my big problem. Perhaps because it is a cylinder on one end of which I want the image to appear. If you can tell where I'm going wrong, it will be a tremendous help to me. I think there's no bug in the texture mapping feature of AOI, it's just not very simple to use (but texture mapping is even worse in Blender). After various tests I found how to apply a texture image on the top of a cylinder. As shown in the following capture, keep Mapping equal to Projection, enter 90 in Rotation X field and enter the diameter of your cylinder in Scale X and Y fields (caution : the properties of a cylinder let you choose its radius so enter twice that value). 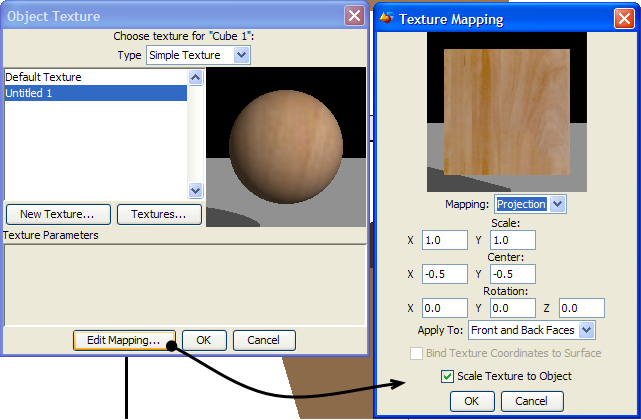 If you want to apply a texture around the cylindrical surface of a cylinder, you should choose Cylindrical in the Mapping combo box. Thanks for this, Emmanuel! I was able to successfully make the top part of a secretary's desk with a wood grain texture! Hopefully you will have the complete desk soon!